California Company Develops Plug-In Hybrid California has set a lofty goal for a new type of high-mileage car that is still on the drawing board: a "plug-in hybrid" that runs mostly on battery power. Americans can't buy one yet — big automakers are still trying to perfect the technology — but a small company near Los Angeles has gotten a head start. Peter Nortman's engineering company is converting a Prius hybrid, which normally gets about 50 miles per gallon, into a plug-in car that runs the majority of the time on electricity. The state of California has set a lofty goal for a new type of high-mileage car that is still on the drawing board: a "plug-in hybrid." 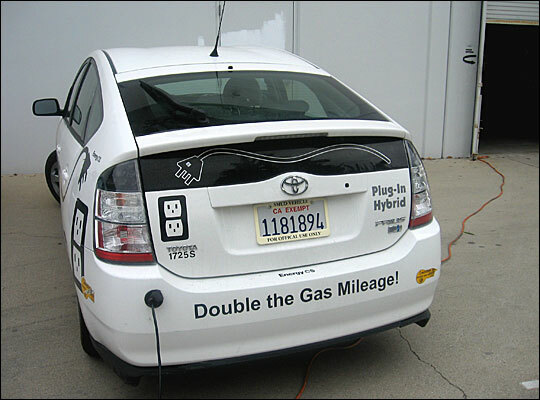 Unlike today's hybrids, which run mostly on gasoline, plug-in hybrids run mostly on battery power. Americans can't buy one yet — big automakers are still trying to perfect the technology — but a small company near Los Angeles has gotten a head start. Peter Nortman says he has a love-hate relationship with cars. As a kid, he loved to tinker with them, but as an adult, he hates what they do to the environment. A few years ago, he started tinkering with the Toyota Prius in his garage in the Southern California suburb of Monrovia. "Actually, it was three guys and two garages in Monrovia," Nortman says. Out of those garages, Nortman's engineering company was born. He and his engineers have converted locomotives to run on rechargeable batteries, and are even trying to make a battery-powered 18-wheeler. But their main focus is taking a Prius hybrid, which normally gets just under 50 miles per gallon, and turning it into a plug-in car that runs the majority of the time on electricity. "Click-click" is all you hear when you turn it on. Nortman has removed the manufacturer's battery from the Prius and replaced it with a lithium ion pack — three times the size. It takes up the whole trunk of the car. Then he drilled a hole in the back fender for the electrical plug. At night, he plugs it into a standard outlet to charge. On a test drive through the tree-lined streets of Monrovia, Nortman shows off. "We are in the high-rent district now. We are going up a really steep hill now, and I just wanted to show you that we are going all electric here," he says. Nortman steps on the pedal, and for the first time during the tour, the car is running on gasoline alone. "It just kicks in, and we could drive all electric or we could have real high performance with the gasoline," he says. After a five-mile spin around town, we head back to the warehouse. "On our trip, we just drove five miles and we just got 340 miles per gallon." Nortman says when you factor in longer commutes with freeway driving, his Prius averages 100 miles per gallon. For now, the conversion cost — more than $10,000 a car — is prohibitive. Nortman says that cost would come down with mass production. So what is it worth to California drivers, who face $4-per-gallon gasoline costs, to get 100 miles a gallon? "Ahhh, probably $2,000," says Scott Haas, who just bought his standard Prius hybrid last month. "As gas goes up, it changes the equation." So, if there is a market for a dependable plug-in hybrid now, and a small California engineering firm can build them, why can't the big automakers produce them? They say they're close, but the technology isn't ready for prime time. California air regulators disagree, and at a public hearing last month, they ordered six major car companies to produce nearly 60,000 plug-ins for the state's consumers by 2014. Engineering professor Dan Sperling sits on the California state air resources board. "What California is doing is taking leadership and telling the car companies that they have got to get started now," Sperling says. The two companies closest to making California's goal, Toyota and GM, say they hope to have prototypes out in a couple of years, but add that meeting the state's mandate for 60,000 plug-ins will be a stretch. In the broadcast version of this report, and in an earlier version of the story published online, engineering professor Dan Sperling was misidentified.